FEBRUARY 21, 2013 — The International Film Music Critics Association (IFMCA) announces its list of winners for excellence in musical scoring in 2012. Unlike in previous years, where one score has taken multiple victories, the main film prizes are split equally between 11 different movies and composers, the greatest spread in IFMCA history. 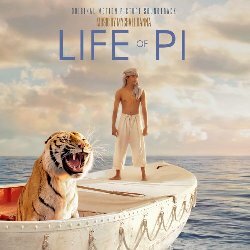 The award for Score of the Year goes to Canadian composer MYCHAEL DANNA for his score for director Ang Lee’s vivid shipwreck drama LIFE OF PI. Danna’s dramatic and beautiful score made use of a large number of Indian musical elements in addition to a traditional western orchestra, capturing through music one the film’s key ideas, the collision of different cultures to form the large, ethnic melting pot from which the lead character, Pi Patel, originates. This is the first Score of the Year award from the IFMCA for Golden Globe winner and double-Oscar nominee Danna, who had never previously been nominated in this category, although he did receive five previous nominations in genre categories for scores such as BEING JULIA, THE NATIVITY STORY and THE IMAGINARIUM OF DOCTOR PARNASSUS. Hollywood A-lister DANNY ELFMAN was named Film Composer of the Year for his outstanding body of work in 2012, during which he composed music for such popular and successful films as DARK SHADOWS, FRANKENWEENIE, HITCHCOCK. MEN IN BLACK III, PROMISED LAND and SILVER LININGS PLAYBOOK. Elfman’s music in 2012 ran the gamut of styles and genres, from the soft rock of Silver Linings Playbook to the Gothic atmospherics of Dark Shadows and Frankenweenie, to the subtle Bernard Herrmann echoes of Hitchcock, cementing his position as one of the most versatile and sought-after composers working today. This is the second Composer of the Year Award Elfman has received from the IFMCA, having previously been similarly honored for his work in 2008. The IFMCA’s ongoing recognition of emerging talent in the film music world this year spotlights 37-year-old Colorado-born composer NATHAN JOHNSON, who was named Breakout Composer of the Year for his unconventionally percussive music for the acclaimed sci-fi thriller LOOPER. To create the film’s unique aural atmosphere Johnson took a standard small orchestra, featuring mainly strings and piano, and augmented them with a massive array of sampled sounds and processed percussion effects, ranging from trash can lids, an oscillating fan, and gunfire to hammered PVC tubes and fire alarms. The end result is cacophonous, unsettling, but weirdly fascinating music that somehow manages to bring together these seemingly random and incoherent musical collisions of sounds into a propulsive, exciting score. Spanish composer FERNANDO VELÁZQUEZ wrote the IFMCA’s Film Music Composition of the Year – “The Impossible Main Title” from director Juan Antonio Bayona’s film THE IMPOSSIBLE, which tells the story of a family caught up in the 2004 Indian Ocean tsunami. Velázquez’s main title is an overwhelming emotional powerhouse, capturing both the tragedy of the situation and the sense of desperation felt by the family concerned. The score was recorded by the excellent string section of the London Metropolitan Orchestra at the historic Abbey Road Studios, and has been praised by numerous mainstream film critics as one of the outstanding elements of the film. This is the first IFMCA Award win for Velázquez, who was previously nominated for his scores EL ORFANATO (THE ORPHANAGE) in 2007 and GARBO: EL ESPÍA in 2009. The various genre awards were won by JOHN WILLIAMS for director Steven Spieberg’s historical drama LINCOLN, WALTER MURPHY for the raucous comedy TED, THOMAS NEWMAN for his work on the near-universally lauded James Bond film SKYFALL, MICHAEL GIACCHINO for the epic Edgar Rice Burroughs space adventure JOHN CARTER, ALEXANDRE DESPLAT for the whimsical fantasy animation RISE OF THE GUARDIANS, and Finnish composer PANU AALTIO for his music for the beautiful nature documentary METSÄN TARINA. In the non-film categories, British composer MURRAY GOLD won the award for Best Original Score for a Television Series for his outstanding work on the most recent season of the classic BBC science fiction show DOCTOR WHO, while composer AUSTIN WINTORY won the award for Best Original Score for a Video Game or Interactive Media for his score for the groundbreaking game JOURNEY, which earlier this year made history by being the first Video Game score nominated for a Grammy. La-La Land Records won the Best Archival Release of an Existing Score award for their magnificent release of Jerry Goldsmith’s classic 1979 score STAR TREK: THE MOTION PICTURE, newly re-mastered and re-released in a lavish 3-CD set. They also continued their monopoly of the Film Music Record Label of the Year category, winning for the third straight year, and solidifying their position at the top of the list of labels specializing in lovingly restoring the greatest film music of the past. Finally, conductor Nic Raine and producers James Fitzpatrick and Luc Van de Ven won the Best Archival Re-Recording of an Existing Score award for the monumental re-recording of Miklós Rózsa’s score for the epic 1951 film QUO VADIS?, which featured stellar performances from the City of Prague Philharmonic Orchestra.